The Artful Dodger – Street view. 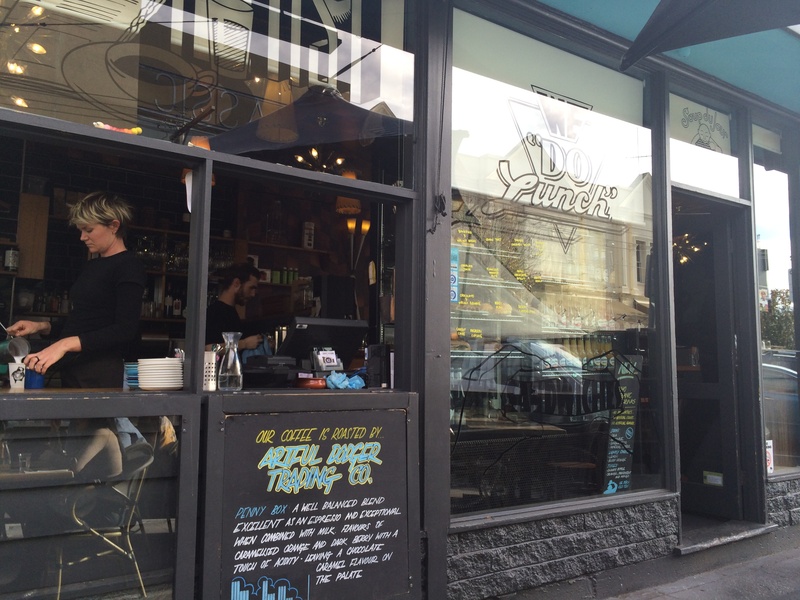 The Artful Dodger is a cool little café opposite Elsternwick station. It’s the perfect place for a Sunday brunch. Artful Dodger is the cunning little criminal boy in the Charles Dickens novel ‘Oliver Twist’. But the only thing criminal about this place is that there are too many delicious things to choose from on the menu. My favourite is the ‘Artful Eggs Benedict’. 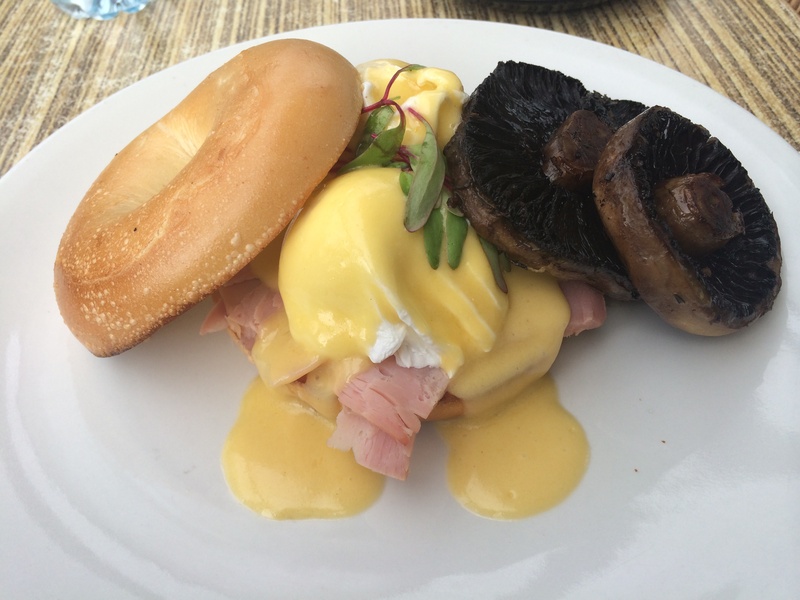 The Artful Dodger – Artful Eggs Benedict w maple baked ham & roasted field mushrooms. The ‘Artful Eggs Benedict’ is two poached eggs with a chive and lemon myrtle hollandaise on a toasted NY bagel. I like it with maple baked ham and a side of roasted field mushrooms. It is absolutely delicious!! The chive and lemon myrtle hollandaise is amazing. It’s a great twist on an old favourite, it’s exciting because it still tastes like a hollandaise but with a different flavour. They used Lemon Myrtle in the hollandaise, which infused a strong lemony flavour, which was clever because I think if they used actual lemon, too much acidity would steal the creaminess. The egg yolks were oozing out as I cut into them, the ham was sweet, the mushrooms were juicy and the bagel was beautifully toasted. All together it was incredible! On a side note, my friend and I decided that ‘Myrtle’ would be a really cute name for a goldfish. Don’t you think? Anyways, if you are having trouble deciding on a meal, the ‘Artful Eggs Benedict’ is a winner. The Artful Dodger – Corn & zucchini fritters w beetroot vodka cured salmon. 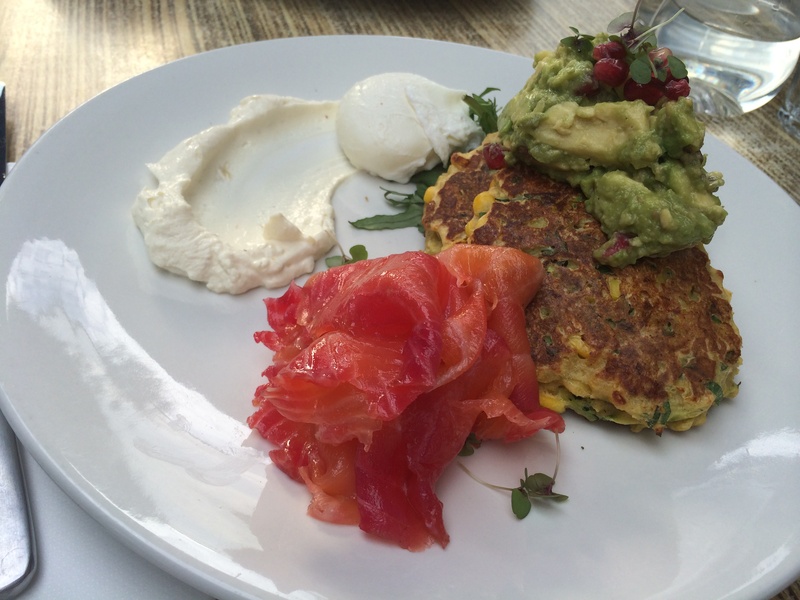 I’ve also had the ‘Corn and Zucchini Fritters’ with avocado pomegranate salsa, with Beetroot vodka cured salmon. It’s really tasty. Fritters that I’ve had in the past have generally been bland, but these fritters surprised me. They were packed with flavour and worked well with the avocado pomegranate salsa. The beetroot vodka cured salmon looked fantastic, parts of the salmon were stained with the colouring of the beetroot it was really pretty. The thinly sliced salmon had an interesting flavour and was smooth and creamy. 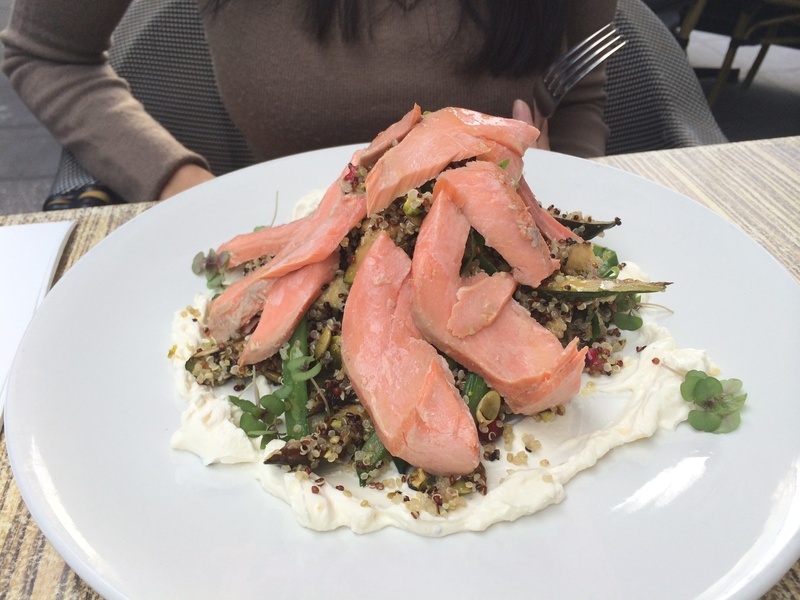 The Artful Dodger – Miso smoked trout w Grilled zucchini salad, quinoa, preserved lemon & fennel labneh. The ‘Grilled Zucchini Salad’ has so many different textures, it’s fun to eat and healthy too. It had grilled zucchini, pistachios, quinoa, pomegranate, green beans and mixed herbs & seeds. It also had preserved lemon and fennel labneh, which brought all the flavours together. Slices of the ‘Miso smoked trout’ were layered on top of the salad, which was delicious on its own or with the salad. This creamy ocean trout was perfectly cooked and melted in your mouth. It was yummy. 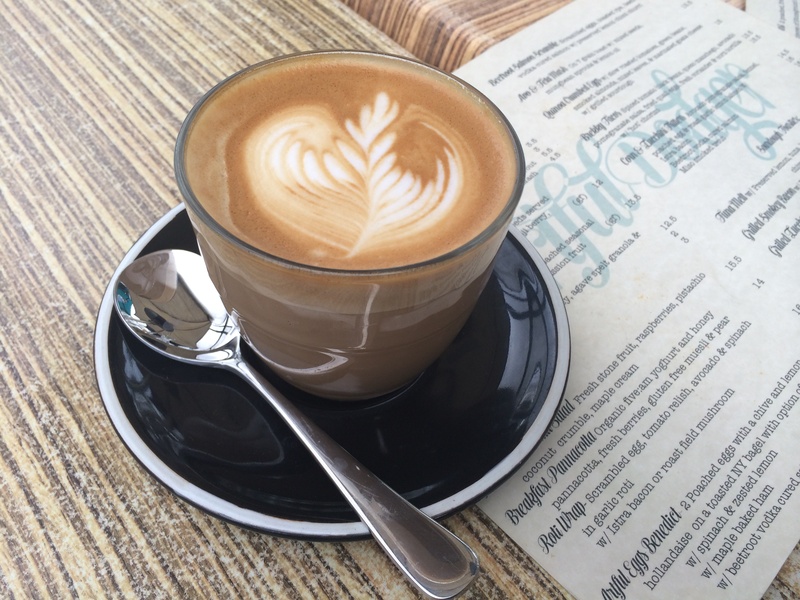 The Artful Dodger – Great coffee. One word to describe the coffee: Amazing! I had a latte and it was delish! They make good coffee. They also have some muffins and slices available so if you’re not particularly hungry you can also just grab a small snack and a coffee. Great food and awesome coffee! They have a small indoor area and a nice outdoor seating area, which is covered so the rain can’t get you. And they have friendly staff to help you with the menu options. Again perfect place for brunch. I have been hearing about this restaurant for years and went there for the first time last week. Everyone who has been there has said nothing but amazing things and I finally got to experience it for myself. Everything I ate was brilliant! This relatively small space is brought to life by the great energy that fills the room. On one length of the room there is a bar with people seated along it and on the other side there is an open kitchen where the chefs are creating the meals. 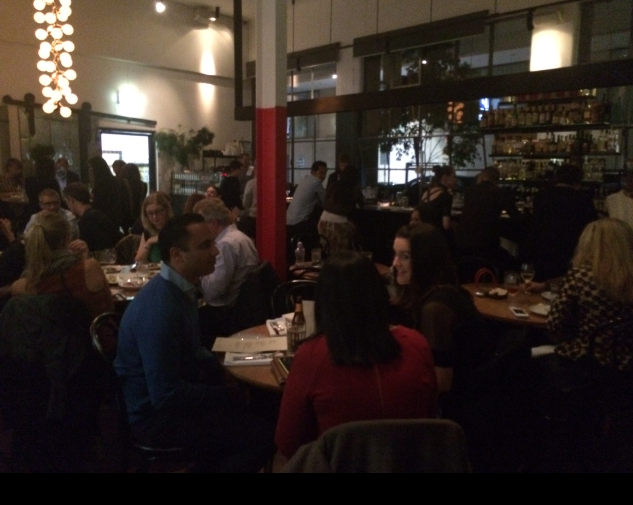 People were seated on round tables in the middle and along the bar and kitchen. It’s a small cozy space with a lot of style. Our waiter politely introduced us to the menu and was thorough in her menu descriptions, which was great. 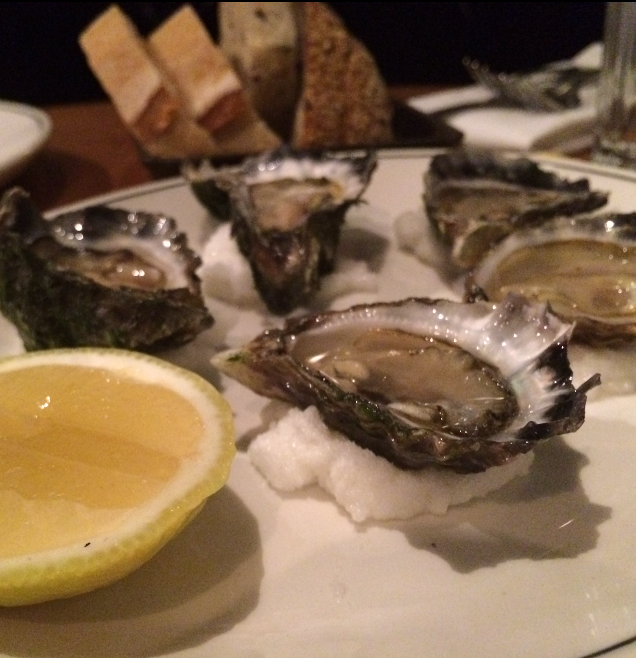 Cumulus Inc. – Mmm Selection of Oysters. We got some oysters to start. There was a list of oysters on the menu, written like a mini wine menu. This was new to me because the only options I’m used to choosing with oysters are whether I want ½ a dozen or a dozen. Our waiter explained the different types and they all sounded divine. We tried a range of different oysters from the selection. Previously I thought that oysters were just oysters but each of those oysters had such varying characteristics, different tastes, different sizes, different textures. Wow! I like the small sweet ones over the mature textural ones but they were all really good. 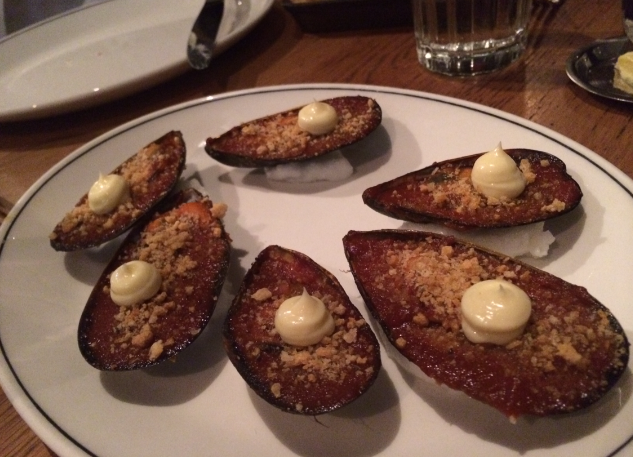 Cumulus Inc. – Baked Chilli Mussels. Next up, baked chilli mussels. The mussels were individually presented with a tomato based chilli sauce that had a decent kick to it. It was then sprinkled with Parmesan breadcrumbs on top with a spot of aioli to put out the fire. They were delish! 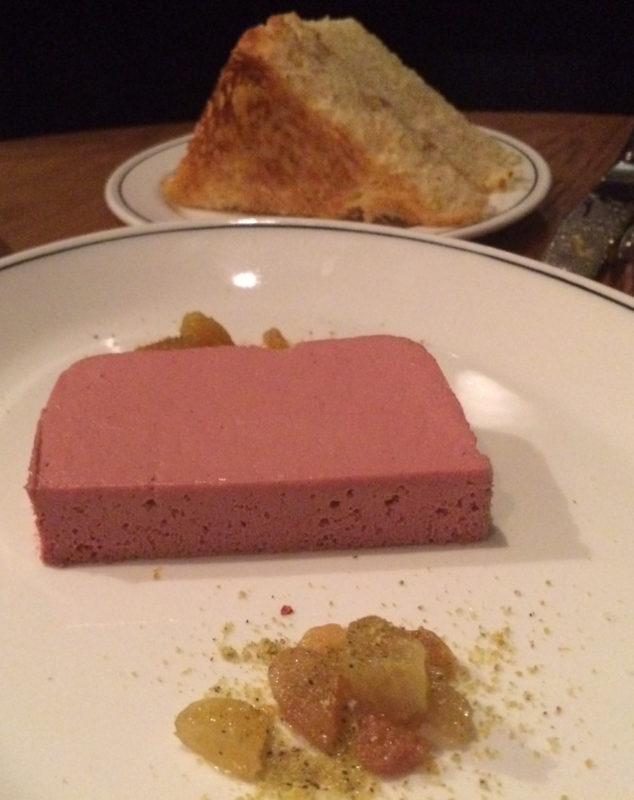 Cumulus Inc. – Foie Gras Parfait w Toasted Brioche. The thickly sliced triangles of brioche were very light and buttery and had a nice crunch to it, divine just on its own. The foie gras parfait was decadent and perfectly smooth, a great pairing for the toasty brioche. It’s delicious in a small dose so you appreciate it. We had three people and ate too much each. I found that if you get greedy and eat too much of the fois gras parfait it starts to leave an oily feeling on the roof of your mouth (that layer of grease feeling you get when you eat a cold sausage roll). Lesson learnt, don’t be greedy. 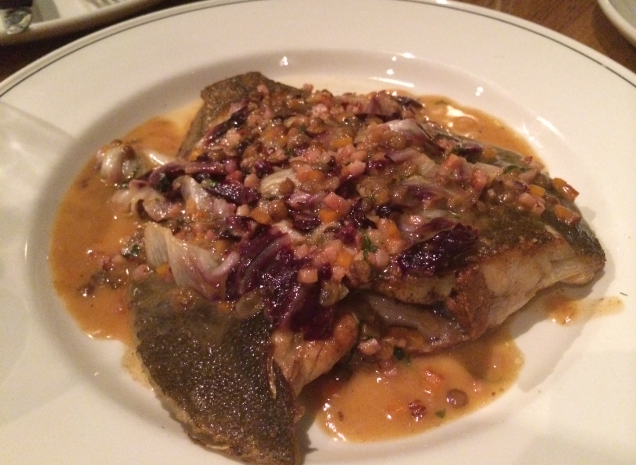 Cumulus Inc. – Flounder w lentils, bacon and radicchio. We ordered the special on the night, which was Flounder with lentils, bacon and radicchio. It was truly delicious! It was the perfect meal for a cold winters night (well cold autumn night). It was comforting and delicious. It was like a lamb casserole but the fish version, layers and layers of complex flavours served in a humble way. It was moreish and full of amazing flavours that worked perfectly. The salty bacon, the bitter riddichio, the creamy lentils and perfectly cooked flounder made it a stand out dish. 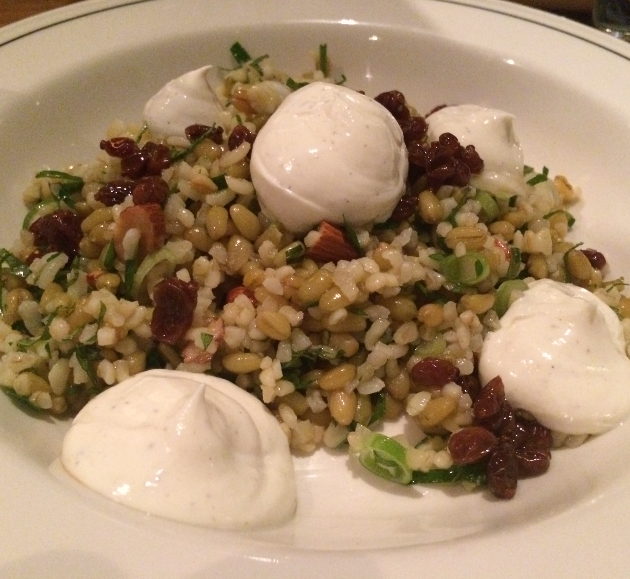 Cumulus Inc. – Cracked wheat and freekeh salad, preserved lemon, barberries. We had trouble deciding on which salad to get because they all sounded good but we shortlisted them down to two salads. We were tossing up between the two options but our waiter informed us that we could get a half serve of one salad and a half serve of the other salad. This was grand, we got the best of both worlds. Yay! I was very excited about this. It was so accommodating. It was a great solution. We decided on the half serve of Cracked wheat and freekeh salad, preserved lemon, barberries, which was so delicious, it was a flavour sensation, there was so much going on, lots of textures and lots of flavours, but it all worked really well. The dollops of yoghurt really brought it all together. 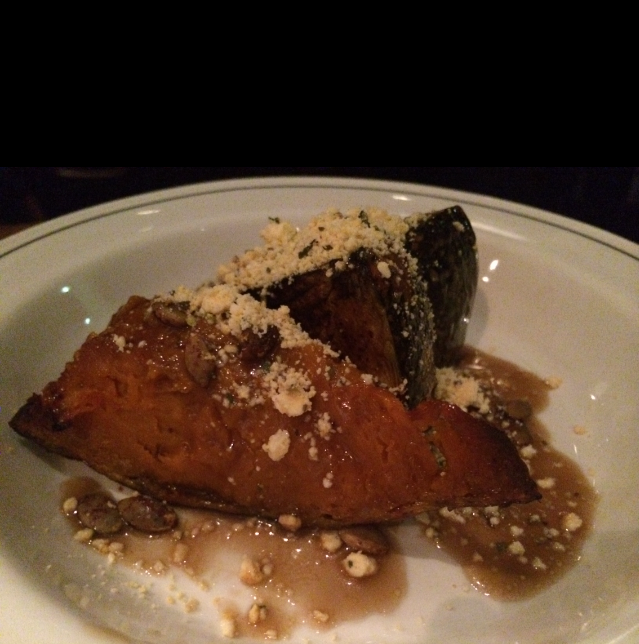 Cumulus Inc. – Roasted pumpkin, pomegranate molasses, shanklish & toasted seeds. For the other half serve we ordered the roasted pumpkin, pomegranate molasses, shanklish (middle eastern cheese) & toasted seeds. It was so sweet. It was literally big chunks of roasted pumpkin with all the ingredients sprinkled on top. It was so sweet and really delicious! I loved how the pumpkin was the star and the other ingredients changed it into an interesting and complex flavour combo. 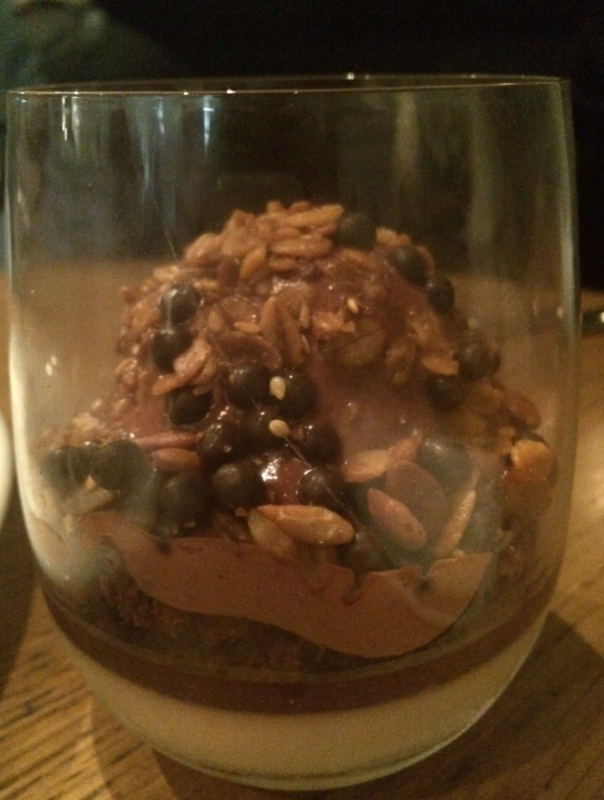 Cumulus Inc. – Chocolate Mess, milk & cocoa nib cream. For dessert we ordered the chocolate mess , which was a chocolate bonanza. Chocolate mousse, chocolate brownie, chocolate bits, chocolate everything! The ice-cream on top tasted a bit sour like a yogurt, which was good because the tartness offset all the rich chocolate tones. Very clever. 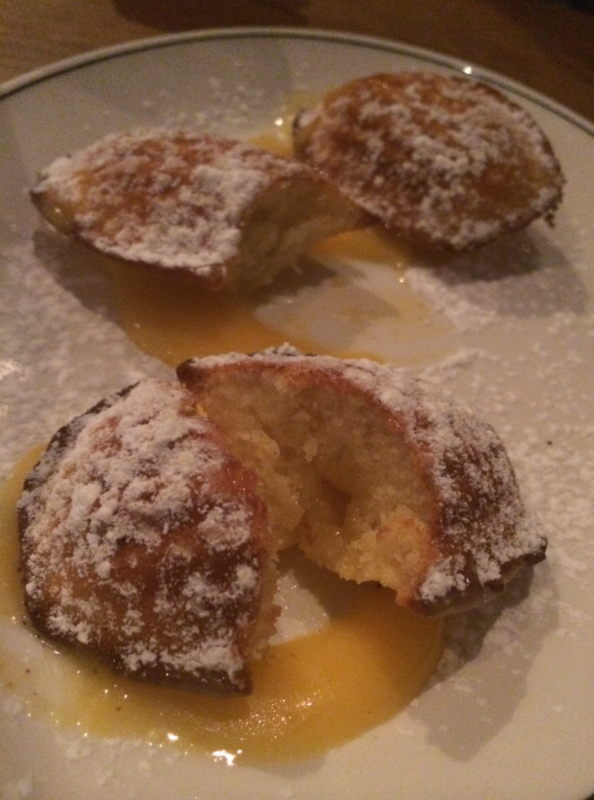 Cumulus Inc. – Madeleines filled with lemon curd. On the menu the madeleines say that they take 15 minutes, which I think is because they are made to order. Yum fresh! They looked beautiful sitting upon little beds of lemon curd. The delicate shell-shaped cakes were golden and crispy around the edges and a were soft and buttery in the middle with lemon curd centres. Delicious! These are perfect with a cup of coffee or tea to finish a wonderful meal. 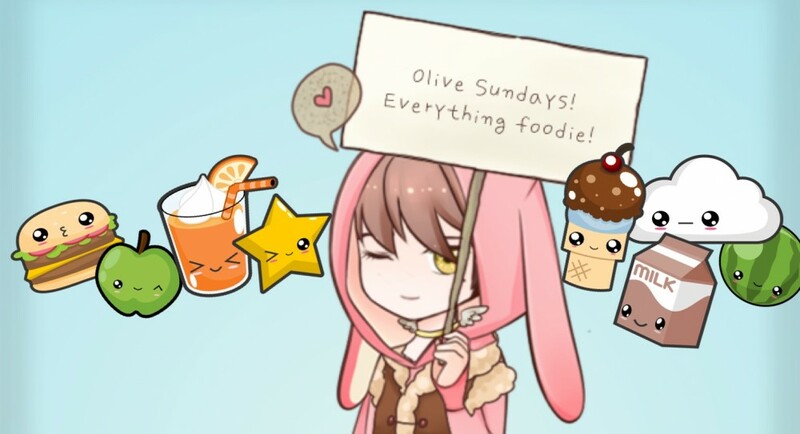 The food was really delicious, and most of all, our experience was fantastic and memorable. There was a good flow of meals (a nice brief break between meals) and the service was great. I was especially excited about the oyster knowledge imparted. I was impressed with the presentation of the food and even more impressed once I tasted the food. It was all very exciting. Will definitely be back. Although sad the flounder is not permanently on the menu. Loved it! Live Below The Line was a Big Success! Gosh. Living on $2 a day was tough and much more difficult than I thought it would be. The thought that some people live with this much or less breaks my heart. I’m really thankful that I completed this challenge because I learnt many lessons along the way. 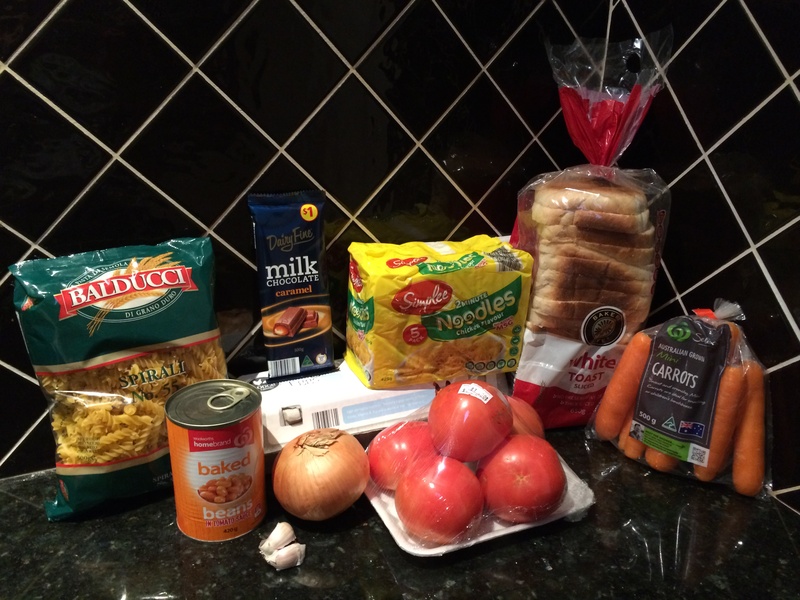 $9.84 – Total spend for one whole week eeeek! There were some trying moments and times where I had a big case of the grumpies (hangry) but overall it was an enlightening experience. Here was what I ate for the five days. I cut up the baby carrots into sticks to snack on during the day. I also brought slices of plain white bread to snack on. Before this I had never realised how sweet white bread is. It’s actually yum on its own (but better with generous amounts of butter or nutella of course). 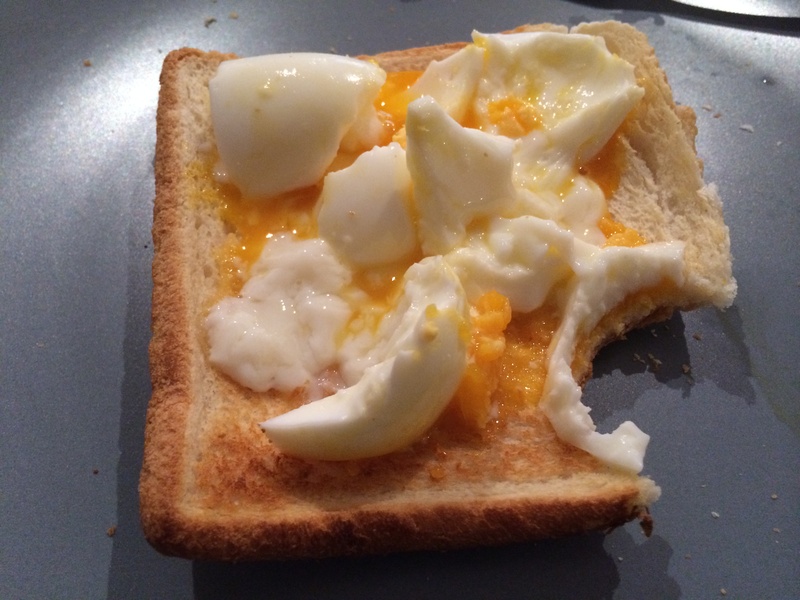 Sometimes I made egg on toast in the morning or the evening if I was feeling particularly peckish. For lunch I had pasta with some baked beans, cooked tomatoes, onion and garlic. It sounds better than it was, It was mainly just boiled pasta. Sometimes on a special day I would add a boiled egg. Mmm. On the first day I was hating lunch but by the third day I had adapted and the pasta was delish (and by delish I mean not so bad). 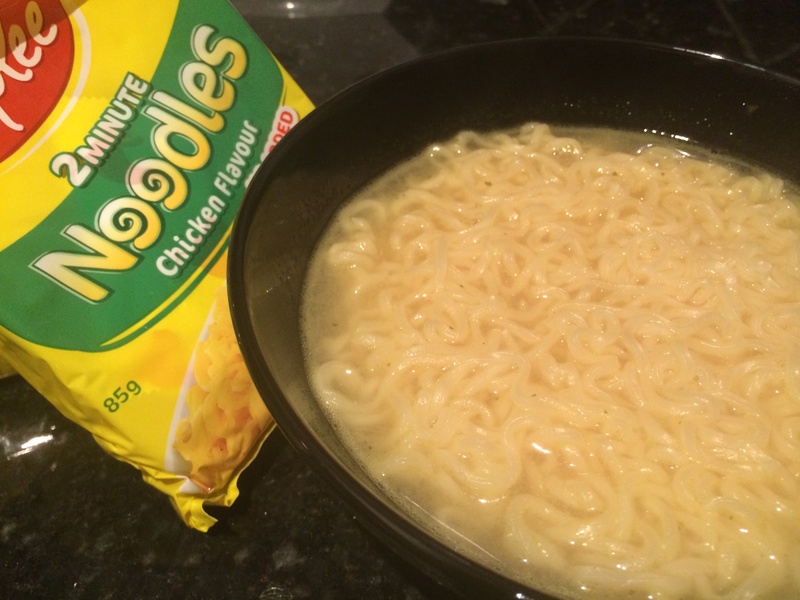 Live Below the Line 2014 – 2 minute noodles. When I got home I would eat a bowl of chicken noodle soup. Yum! I would dip bread soldiers into the soup, which was pure heaven. Truly, on a cold day, warm soup is perfect. For my evening treat I had chocolate. I had to ration the block so I was able to eat three squares of caramel chocolate per night. I savoured every bite. The people around me were very supportive and made the challenge easier. The first day was challenging. I didn’t bring enough snacks so I was starving by the time I got home. On the fourth day I was really feeling crappy in the morning and I just wanted it to end. I ate the rest of the chocolate to feel better (Thursday AND Fridays portion oops). And by Friday I was running out of food. It was a tough five days but I made it. At 12.01am on Saturday morning it was time to feast. Live Below The Line 2014 – Saturday 12.01am Time to feast! Ding! 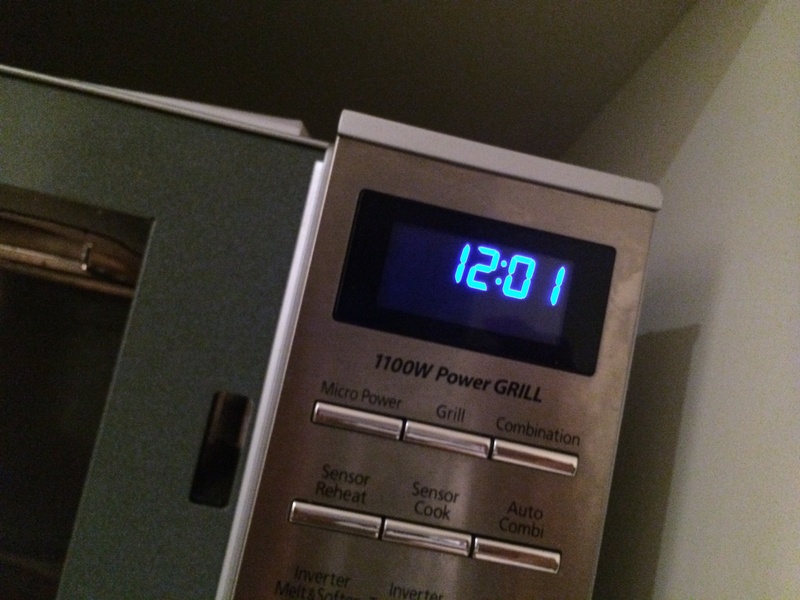 At exactly 12.01 I open the microwave, and starring back at me is a reheated Huxtaburger ready to be eaten. YUM! YUM! YUM! It was so indulgent, so delicious. 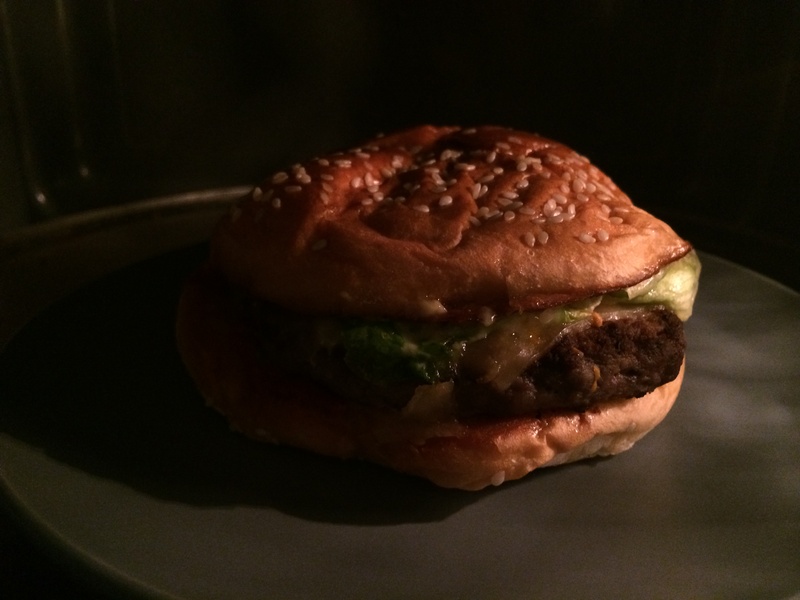 I couldn’t believe the intense flavours coming out of this little burger. My taste buds were on overload. It was magnificent. 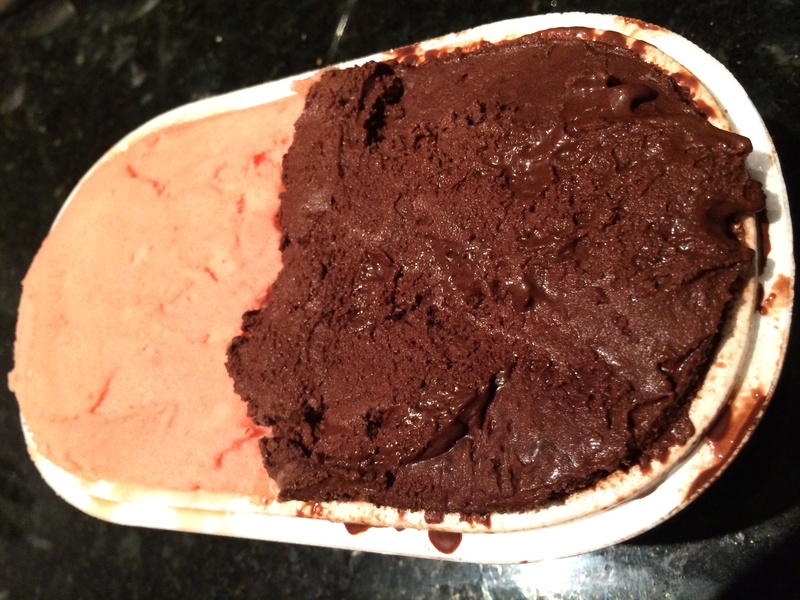 Also I had half a kilo of my fave icecream from Geletello. Dark chocolate and Blood Orange yum yum yum! (don’t worry I didn’t eat it all at once). I’m glad I participated in Live Below the Line this year because it has taught me to see the world as a whole and that together we CAN make a difference. Live Below the line had over 10,000 people participate this year and raised over 1 million dollars which is pretty damn awesome. Don’t take food for granted – I thought about the masses of food that is wasted every day. I know a lot of vegies that perish right before my very eyes in my fridge each week. Not any more! If I buy them, I’ll eat them. Money should not be wasted – I thought about where my money could be better spent. Hmm should I buy that sweater that looks similar to another sweater I already have or should I spend that same amount to help a less fortunate young person buy uniforms and text books for 3 years? I realised that I spend money on too many unimportant things. Be grateful for what you have. 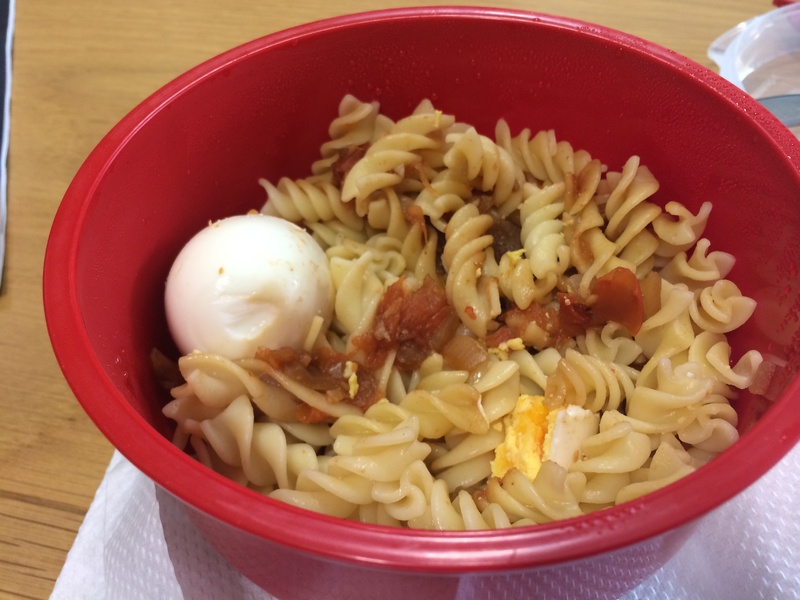 I had boring pasta every day for lunch, which was frustrating because it didn’t have much flavour but then I thought about how some people would be grateful to have any food just so that they can survive. That single thought made my pasta instantly taste better. 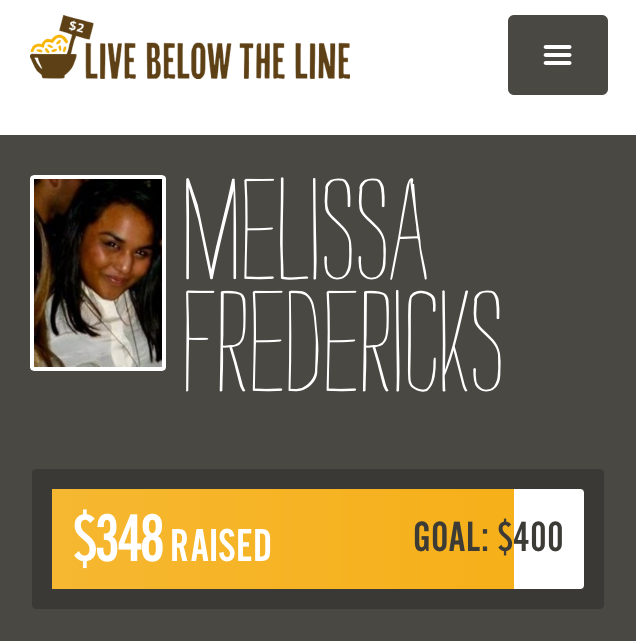 Live Below the Line 2014 – Donate to a great cause! Life is too short to be complacent. Spend your time on things that matter! I heart Live Below The Line!